Not all pilgrimages reveal themselves as such. Some may seem, as with my experience at Green Gables, to be merely a trip of curiosity that becomes something more. At other times, we may know our destinations but perceive them more as goals or perhaps only an indistinct longing. We don’t consider them as places that require a journey – much less a pilgrimage – to reach. Such for me was The Magic Castle in Hollywood, California. A private club devoted to the art of magic (think David Copperfield, not Harry Potter), The Magic Castle beckons magicians and guests from around the world to its Victorian-styled exteriors, intimate theaters, classy bars (even if you don’t drink, the barstool that descends ever so slowly will make you think you did), gourmet restaurant, secret passages, hidden nooks and subtle trickery. The Magic Castle– or more precisely, becoming a member of this exclusive club – became a destination for me as a youth, one as much psychological as geographic. It became a symbol of achievement, proof of a certain level of skill and art in the area of magic. My journey to The Magic Castle, however, began long before I knew of its existence. When I was twelve years old, I visited Disneyland – not such an unusual feat for a kid who grew up only 40 miles away from the theme park. Normally, my entire attention there was on the rides, but one evening I ventured into Merlin’s Magic Shop in Fantasyland. Who knows what causes each of us to respond to certain places the way we do, but Merlin’s captivated me. The combination of exposed wood beams, stone walls and recessed lighting created an atmosphere of mystery that sparked something in my young heart. 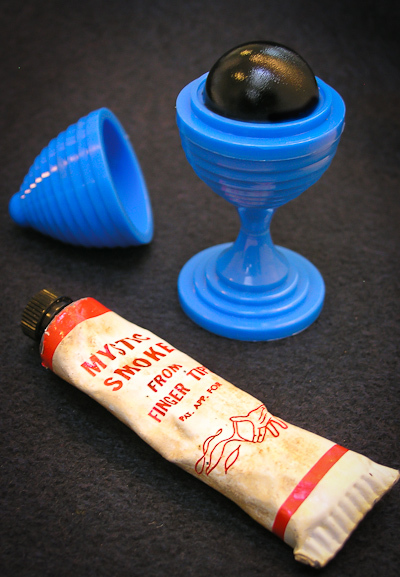 After reviewing the various small tricks sold there, I opted for a blue Ball and Vase trick and a rubber frog (both of which I still have). So what if the frog wasn’t an actual magic trick: What twelve-year-old boy can’t find some use for a realistic looking rubber frog? And so with these purchases, I became hooked on magic. From that point on, I began reading every book I could get from the library on the subject. I also perused the classified ads in the back of Boys Life magazine and ordered numerous magic catalogs offered there. I saved up my paper route money and was soon buying tricks to add to my repertoire. Some, I would learn, didn’t quite live up to their descriptions. Take “Mystic Smoke” as an example. The ad implied that great clouds of smoke would magically erupt from my fingertips. Instead, I received a tube of goo that you vigorously rubbed between your thumb and index finger. You then separated the two digits rapidly with a sort of lofting motion of your hand, like the pontiff giving a beneficent wave to the adoring crowd. What was supposed to resemble wafts of smoke from your fingers instead looked more like tendrils of model glue, gossamer webs of some unknown chemical substance floating through the air and sticking to clothes, furniture, the dog, etc. Enough of my purchases, however, lived up to their hype and so with concerted practice, I became good enough to do shows beyond my family and friends. As I progressed in my craft, I also found new sources of information about magic. I came across magazines written by and for magicians. I learned of associations such as the Society of American Magicians or the International Brotherhood of Magicians. And then one day, I learned about The Magic Castle, a place only an hour away from my home, yet years away from my reach. Somehow, I vowed, I would become a member there. And so began my pilgrimage – my quest actually – in earnest. Continued in Part 2, Part 3 and Part 4. Trust me, you’ll definitely want to read the next entries!